We lost power for about 12 hours on Sunday at the cottage. It had been raining all day, and just before noon, the wind really picked up. The large trees were swaying and there were actual waves on the channel in front of the cottage (usually it’s just a little current). We knew that it was likely that we would lose power, and it wasn’t long before the lights started dimming and went out. Power did come back briefly a couple of times but didn’t stay on (until just before 1am Monday). Luckily I had lots of hand work projects that I could do during the day, while there was light. My husband was installing some new lights in the kitchen, and has some battery powered tools, so that was OK too. We always keep some jugs of drinking water on hand (we lose our water pump and sterilizer with no power) and I finished cooking the soup I was making for lunch on the BBQ – it has a side burner. I was going to puree the soup, but since I had no power for the blender, I mashed it instead and it turnout out well (curried sweet potato and white bean soup – yum!). Since the kitchen is under renovation and it was getting dark, we ended up going out for dinner. We were teased when we got home to see lights on in the cottage, but just as I put the key in the door, out they went again. Out came the candles and my knitting. 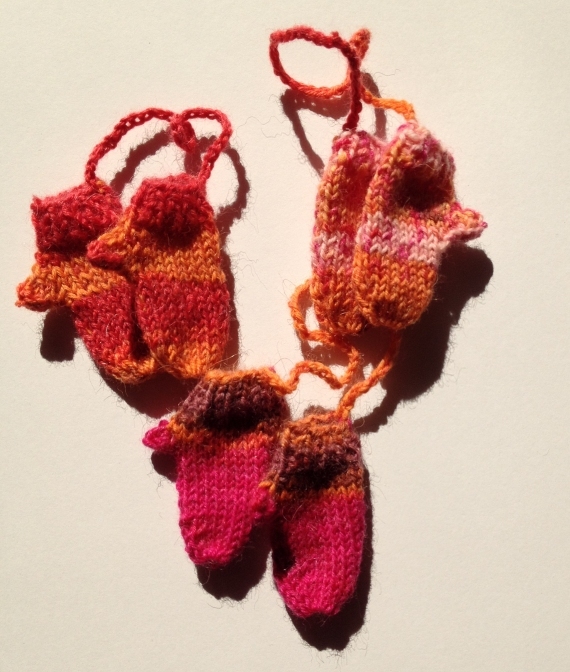 I managed to knit a pair or mittens before going to bed under the light of seven candles! 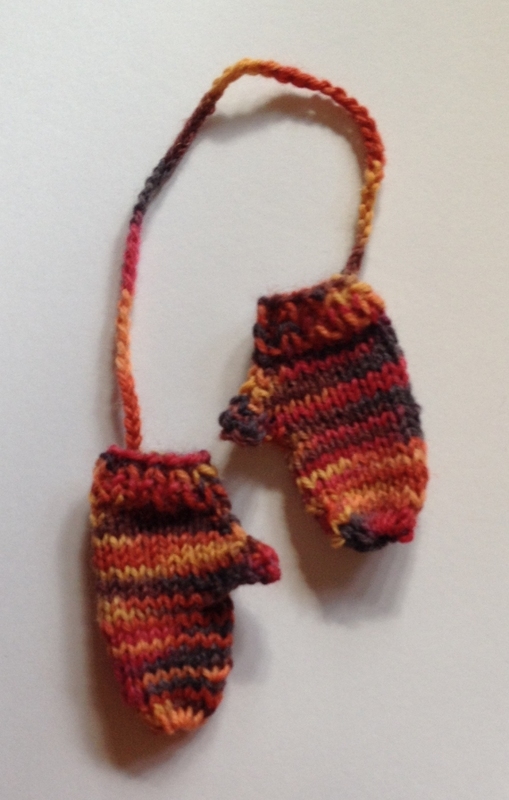 OK, they are little mini mitten decorations, so each mitt is only 2″ long – but I got the pair of them finished that evening and felt like a pioneer. I choose to use my variegated yarn rather than the self-striping sock yarn that I’ve used for a few other pair because I didn’t want to deal with trying to find the place to start in the candlelight. These three pair are all made from the same ball of sock yarn, but look completely different since I started each at a different point in the yarn. I knit one mitt from each pair and by the time I’d finished the 3rd one, I was just about back to the same pattern in the yarn, so that I could get a pair of matching mitts. This entry was posted in ETSY, Knitting and tagged cottage, ETSY, knitting, ornaments. Bookmark the permalink.